The year is in full swing, and it’s been so great seeing all the blocks created so far. 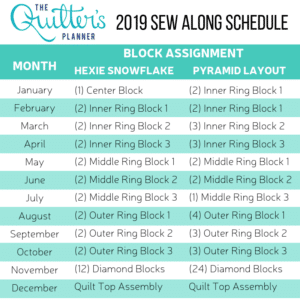 If you’re sewing along with us and want to enter to win prizes each month, post your finished blocks to Instagram or in our Facebook group (between February 15th and February 28th) with the #QP2019sewalong hashtag. Each month, we will post tips and tricks to help you with your blocks. To keep up with the Tips and Tricks, visit our 2019 Block of the Month Landing Page here. You might want to make it one of your Favorites on your computer so it’s easy to find. 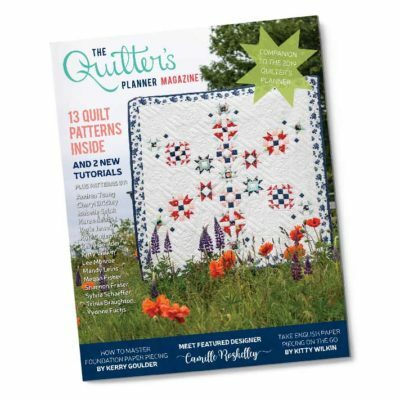 You can also find it on QuiltersPlanner.com under the Patterns and BOMs tab. This year, there are two amazing layouts for you to choose from: the Original Snowflake Layout or the Alternate Pyramid Layout. In January, there was a different block to make for each layout. 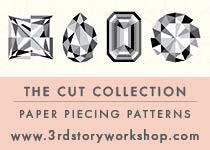 From here on out, no matter what layout you chose, you will be making the same block, but often in different quantities. We will let you know each month how many blocks to make for your chosen layout. And in case you’re the planning type (and we’re guessing you are! ), here is the schedule for the entire year. You can also find the schedule on our 2019 BOM Landing Page. Which Block Should I Sew in February? The block for February is Inner Ring Block 1. 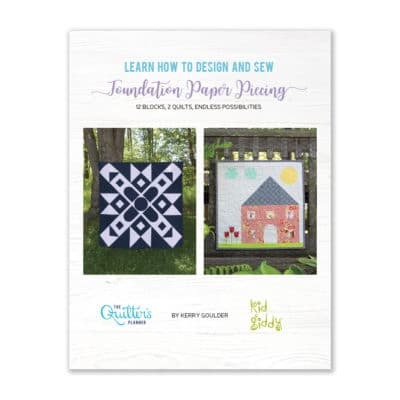 Instructions for this block are on page 17 of the Quilter’s Planner magazine. Pyramid Layout: This is the same block you made last month. In February, make two more. Tip #1: As tempting as it may be when cutting all the background fabric rectangles, it’s best to not stack and cut too many layers of fabric at once. Cutting through more than two layers of fabric can lead to inaccurately sized pieces, which will affect your block size down the road. Best to take the extra time now and save yourself a headache later. Tip #2: When marking your HSTs, make sure your marking pencil is nice and sharp. 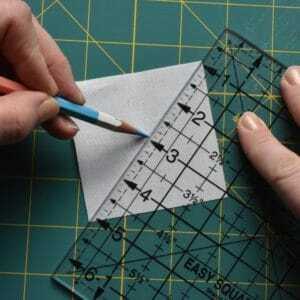 A sharp point can get right next to the very edge of the ruler, and your line will be exactly where you intend it to be! Tip #3: Take care when pressing your HSTs units. Tugging them open or pushing too hard on them with your iron can distort the square. 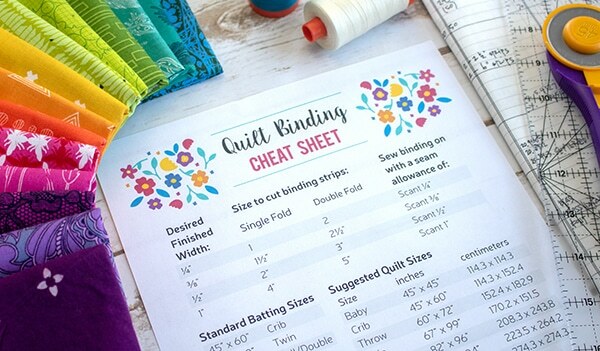 Gentle opening and pressing will give you a beautiful HST. 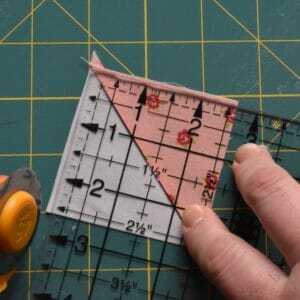 Tip #4: One way to trim your HST is by using a square ruler with a diagonal line. 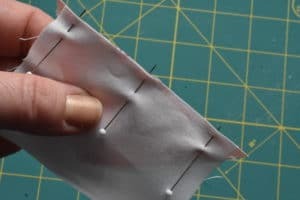 Line up your HST seam with the diagonal line. 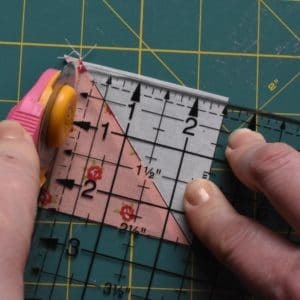 Before cutting anything, check that the sides of your HST that are under the ruler reach at least to your desired final measurement, in this case, 2.5″ (Figure 1). Trim up two sides of the HST (Figure 2). Turn the HST so the trimmed sides are now under the ruler. Line the edges up to the desired measurement. 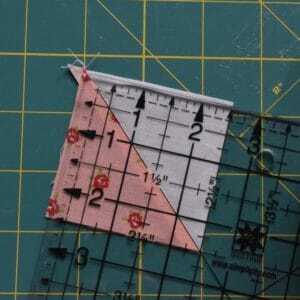 The diagonal line on the ruler should line up with the seam (Figure 3). Trim the last two sides (Figure 4). Remember to always check before cutting that your HST unit lines up with both the vertical and horizontal measurement lines as well as the diagonal line. And one more thing of note: even if you only have the tiniest bit to trim off, please do so! 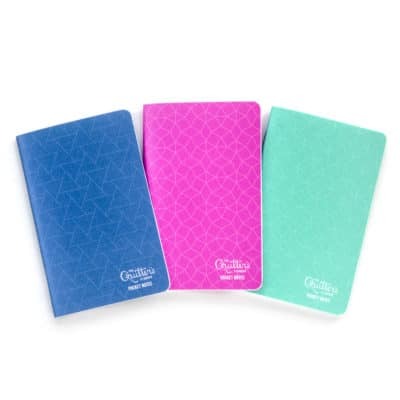 Having them perfectly square will make a big difference down the road. 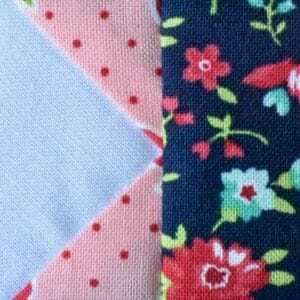 We will be sharing other ways trim up HSTs in the coming months! 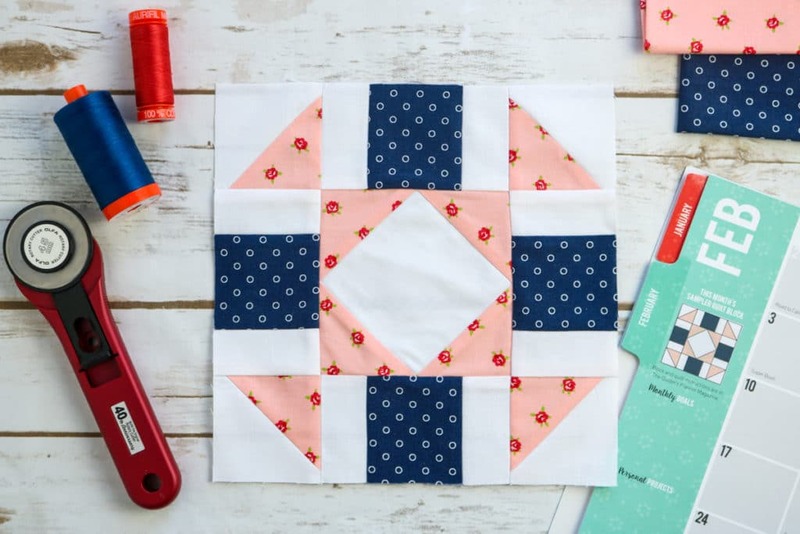 Tip #5: When making your SiaS units, be sure your corner triangles are staying centered on your center square and that they don’t stretch as you sew. Off-centered triangles will lead to a distorted finished square that won’t trim up correctly. You can use Wonderclips or pins to help keep the triangles in place. Tip #6: Before assembling your rows, double-check that your HST units are facing the correct way. 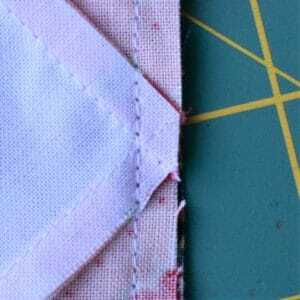 Tip #7: When assembling the center row of your block, be sure your seam is a scant quarter-inch. If it is more, you could sew the point of the SiaS unit into your seam, thus ‘cutting off’ the point. 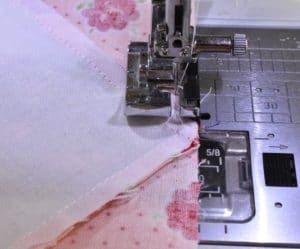 One thing that helps is sewing with the SiaS unit on top and watching as you sew that your seam line is just to the right of your SiaS point. 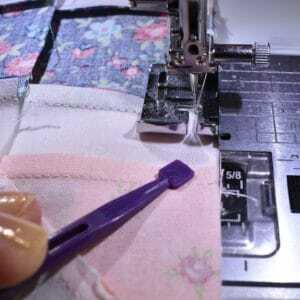 Tip #8 As you make your final seams, be sure that your seam allowances stay laying in the directions they were pressed. A stiletto tool is really useful to hold those seam allowances down while keeping your fingers a safe distance from the machine needle.